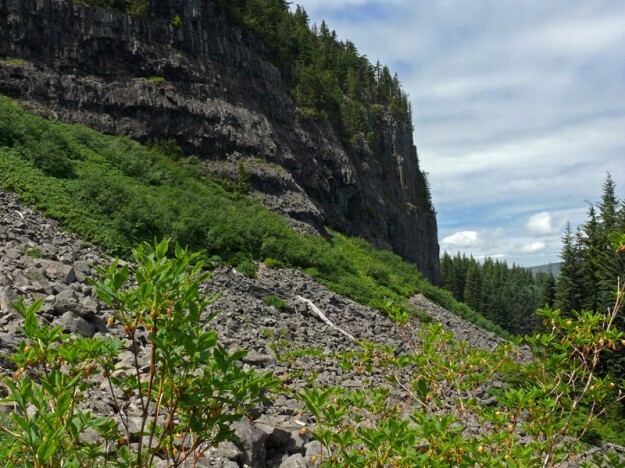 This popular trail in the small table Rock Wilderness leads to an old lookout site with great views of Mount Jefferson and Mount Hood. It also boasts an impressive talus slope—inhabited by many adorable pikas—and massive cliffs covered with rock-loving plants. Several very rare species can be found along the way. The rhododendron display is spectacular in June. Just east of downtown Molalla, turn south onto S. Mathias Road, and then veer left onto S. Feyrer Park Road. After 1.9 miles total, at a tee just past the park, turn right onto S. Dickey Prairie Rd. Follow this for 5.3 miles, then turn right and cross the Glen Avon bridge over the Molalla River. Continue south for 12.7 miles on windy S. Molalla Forest Road. Veer left at a sign for Table Rock trailhead onto gravel Middle Fork Road 7-3E-14. After 2.6 miles, turn right onto 7-3E-7. After 1.9 miles, stay straight on Table Rock Road 7-4E-7 at an intersection. The current trailhead is 2.4 miles farther where the road is now blocked off. The trail follows this road for 1.3 miles before reaching the old trailhead on the right. Stay left at an apparent trail junction that comes up very quickly.